President Lyndon Baines Johnson's birthday was the other day, August 27th. That's the same birthday as New York Times bestselling author Roger Stone! 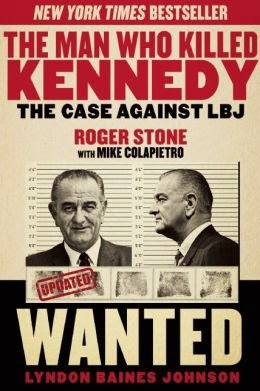 To celebrate their shared anniversary, Stone has a special present for LBJ: the 40-year Washington insider just released the new edition of "The Man Who Killed Kennedy: The Case Against LBJ." The updated bestseller includes two new chapters and an afterword that supply new information on the man Stone calls "the most amoral, corrupt, greedy, coarse, ruthless, psychopath to ever occupy the White House." Stone establishes LBJ's motive, means and opportunity to orchestrate Kennedy's murder and uses both eye-witness testimony and fingerprint evidence to tie convicted murderer and long-time Johnson hit man Malcolm ‘Mac' Wallace to the sixth floor of the Texas School Book Depository and John F. Kennedy's murder on November 22, 1963. Stone reveals how LBJ ordered the murder of at least 17 men, according to White House Aide Cliff Carter, to cover-up voter-fraud and corruption. "LBJ would order a murder the way you or I would order a ham sandwich," said Stone. Stone reveals the plans of syndicated columnist Drew Pearson, who had written a story accusing LBJ of bribery in a $7 billion dollar jet fighter contract doled out to Texas firm General Dynamics. Bobby Baker associate Don Reynolds, in testimony on the morning of the assassination, detailed Baker carrying a suitcase containing $100,000 to LBJ in payment for steering the contract to the Fort Worth company. The story with details of the sweetheart deal were to hit newsstands and 700 newspapers November 24, 1963. Instead, it was spiked after LBJ became President. Stone outlines how Attorney General Robert Kennedy intended to prosecute LBJ for corruption in both the Bobby Baker and Billie Sol Estes cases. Johnson knew he was being dropped for the 1964 Democratic ticket and his federal prosecution were both imminent. Stone establishes that LBJ authorized the false flag attack on the USS ship Liberty by the Israeli air force in a military operation designed to provide a pretext for war with Egypt. 34 American servicemen were killed on Johnson's orders. Stone names names, identifying at least three illegitimate children fathered by LBJ while President or Vice President and revealing Johnson's simultaneous sexual affairs with five women in the White House Secretarial pool. Stone outlines how LBJ stole $1 B in Gold bullion from the US Government, had the gold flown to the LBJ ranch and then later to Canada for smelting. Stone also documents Johnson's daughters unloading the gold on the International market after LBJ's death. Stone tells the compelling tale of the Vietnam war profiteering of Lyndon and Lady Bird Johnson. He exposes their stock ownership in defense contractors who benefited from multi-million dollar contracts that were part of Johnson's escalation of the Vietnam war. Stone even outlines how contracts for military helicopters with one company, Kaman, were abruptly canceled and re-award to Bell Helicopter where the Johnsons owned stock, just days after LBJ became President. Stone exposes how Johnson learned about and canceled a military plane ordered by Vice President Humbert Humphrey that was to fly a Boston brain surgeon from Boston to Los Angeles in attempt to save the wounded Robert F. Kennedy's life. "Is he dead yet? Is he dead yet?" Johnson barked, when informed of Kennedy's condition. The hardcover edition of The Man Who Killed Kennedy - the Case Against LBJ" reached number 15 on the New York Times bestseller list last Fall. Now the new updated paperback edition greatly expands the case against the most evil and mentally unbalanced man to ever occupy the White House. And it is out just in time for LBJ's birthday! Order your Copy Today - Now in Paperback - The new UPDATED edition of The Man Who Killed Kennedy the Case Against LBJ- with two new blockbuster chapters. SPECIAL BOOK SIGNING -- AUSTIN TEXAS -- Sept 16. Book People, 603 N. Lamar Blvd Austin, TX - 7 PM.